The professors have landed! What shall we do today friends? Plan to take over the world of course! You are a mad scientist, trying to threaten the world into submission, racing to build terrifying inventions like a freeze ray or robotic pet before your opponents can do the same. Building such contraptions will require research, hard work, and a certain amount of espionage. You make decisions simultaneously, and can earn money by anticipating what other players will do on future turns. With 36 rule changing twist cards, no two games are ever the same. 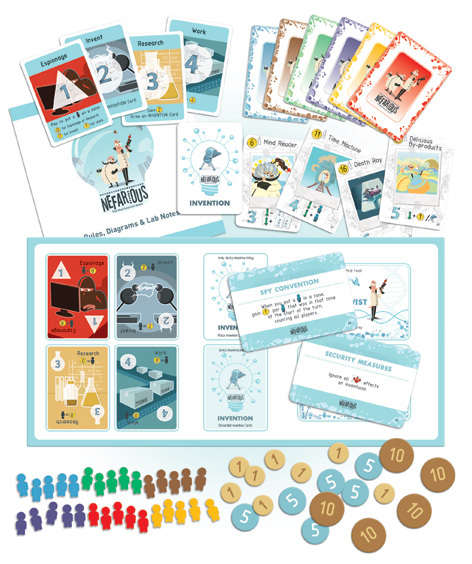 The player with 20 points or more at the end of a turn, and more points than their opponents wins. 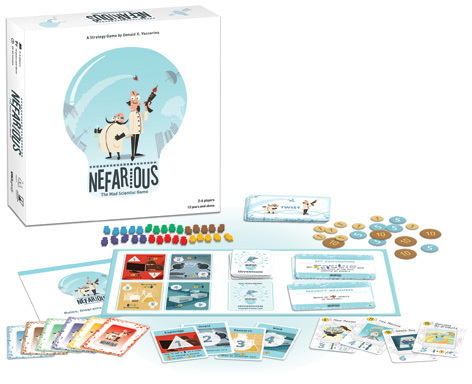 Nefarious is a simultaneous action card game for players aged 13+ and designed by Donald X. Vaccarino, creator of Dominion. Are you ready to play the most destructive game in the history of mankind? Please tell us what you think of Nefarious by Coiledspring Games.